I was looking for a way to make the adjustment for my power supply more precise and easier to dial let’s say to a voltage like 3.3 , but without a built-in fine tune potentiometer this was difficult so I found one of those foam rings that are always on top of a CD box, and it fit perfectly over the dial making it bigger and now easier to dial any voltage. This works based on the “gears” principle – with the larger “gear” attached , finger has to travel a longer distance to make same change, thus easier to dial anything in between that was before harder. 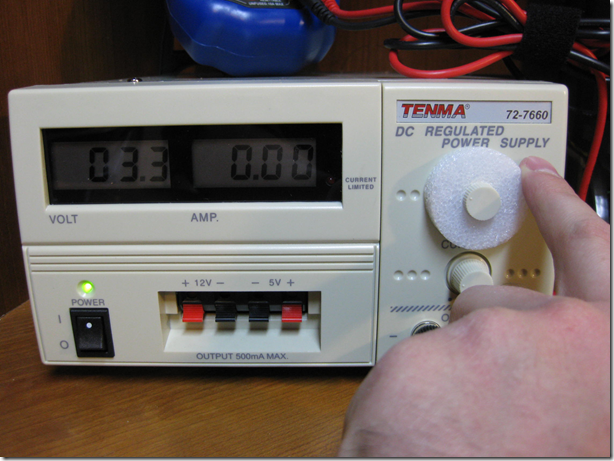 Plain and simple, but just thought to share the non-warranty voiding trick – acceptable choice if you can’t really open up the power supply and add a new potentiometer in series with the main one. I am also glad I finally found a use for those CD foam rings If you’re curious what power supply it is on the picture, it is a Tenma budget 10A linear power supply works well except the above mentioned lack of fine-tune dial.